Alibaba Cloud Data Transport is a PB-level, point-to-point, offline data migration service. You can use secure equipment to upload large amounts of data to Alibaba Cloud. Data Transport can help you resolve common problems associated with data migration to Alibaba Cloud. Common issues include expensive dedicated lines, lengthy transmission times, and potential security risks. Data Transport allows you to upload large amounts of data securely and efficiently all while reducing costs. Compared to traditional techniques of data transmission, either over the Internet or using a high-speed leased line, this solution improves efficiency by up to 20 times and reduces costs by up to 60%. The point-to-point device encryption ensures strong data security during data transfer. Data Transport allows a large volume of data to be migrated offline in a single batch, significantly reducing logistics and network costs. Each device supports data migration capabilities of 100 TB or 480 TB. By using multiple devices concurrently, Data Transport can quickly scale to migrate data at the PB level. Data Transport supports local file systems, NAS, HDFS, and FastDFS. Data Transport is deployed using specialized devices designed for data migration, standard racks, and power supplies. Multiple devices can be implemented at the same time to improve migration efficiency. Data Transport can reach a maximum data compression ratio of 30:1. Data is automatically deduplicated and then automatically recovered during the migration process. Small files are merged automatically to improve read and write efficiency. Device encryption allows you to manage passwords so that only you can decrypt the devices. You can perform RAM authorization allowing for the synchronization of data to a designated storage space on the cloud. Official data deletion instructions provided by Alibaba Cloud allows a user to erase data after the migration is complete so that third-parties will not obtain sensitive data. 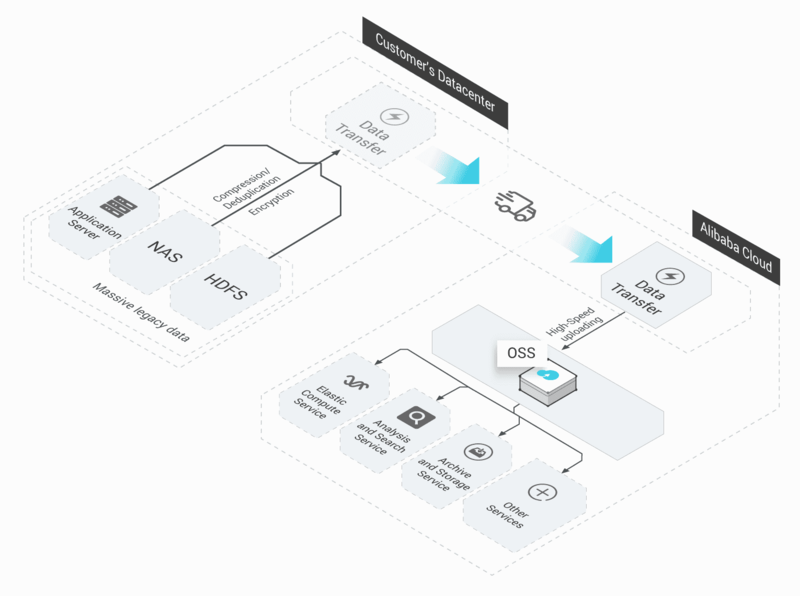 A wide range of local data sources are supported, including local shared storage, local storage systems, local storage arrays, HDFS, and fastDFS. Instead of leased lines and the Internet, this service adopts a logistics system offering next-day delivery. Both the remotely limited self-service and an on-site specialist service are available. Supports both TB-level and PB-level data migration. Migrating TB-level and PB-level data to Alibaba Cloud at low costs and with high efficiency. Instead of leased lines and the Internet, this service uses traditional logistics systems offering next-day delivery to perform data migration. Includes both the remotely limited self-service and on-site specialist service. Supports TB-level and PB-level data migration.